Williams fortified his modernist bonafides by authoring two books of low-cost house plans for returning World War II GIs. For one, he even got Richard Neutra to contribute a design. 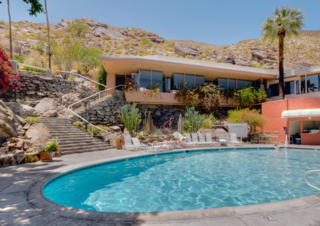 Among Williams' modern homes, the Lucille Ball-Desi Arnaz home in Palm Springs (1954, demolished) stands out as a prime example of desert modernism, with its decorative rockwork and glass walls opening to the pool. The flat-roofed Lumley home, in San Marino (1959), is an abstract composition of vertical and horizontal planes with a sky-lighted living area. Williams designed modest modern as well, including a simple, three-bedroom, single-story glass-walled beauty on Broom Way in Brentwood in 1951. Compact, without a wasted inch, the house has walls of glass, a galley kitchen, and an angled brick fireplace. Are modern architects devoted to prefab and unusual materials? During the late 1930s Williams designed a concrete ‘house of experimental nature,' plus portable houses of steel. Did modernists occasionally slip into the world of Googie roadside architecture? Williams did too, with his La Concha Motel in Las Vegas. It included a space-age lobby of parabolic concrete shells—a hyper-modern version of Williams' characteristic curves. When the motel was ripped down, public outcry rescued the lobby from the same fate. It was moved to another site, and is now the visitor center for the Neon Museum. A. Quincy Jones with Williams collaborate in the late 1940s. Still, the sheer beauty of his more traditional homes and their renown have simply crowded out from consciousness Williams' more outwardly modern work. Also, Williams employed or collaborated with so many younger architects who were known for their modern designs that it is easy for outsiders to credit his firm's more modern output to these men. Don't believe it, Jeh Johnson, who worked for Williams on a modern house for Frank Sinatra, then became a friend, said in a recent interview. “Everything that came out of his office had Mr. Williams' imprimatur. Everything had his ideas and his hand as part of it,” Johnson said. “He did it with a rather skillful eye,” Johnson said of Williams' modern work. Still, it is often clear from the architecture that other hands made their mark. In the Palm Springs Tennis Club restaurant, for example, which Williams designed with his friend and former employee A. Quincy Jones in 1947, the dramatic, angled-glass walls are a typical Jones element, while the gracious curves of the bar and rear windows are clearly Williams. 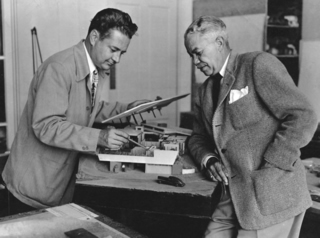 Some architectural historians argue that Williams was not the designer on the most modern projects that his firm worked on, including his collaborations with Jones, and say the Theme Building was designed by Perreira and Luckman, not by Williams. 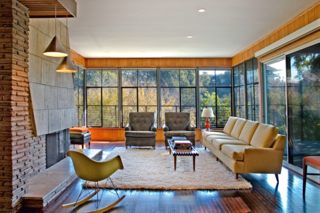 Recent photo of the living room of Williams' 'modest modern' Broom Way house in Brentwood, 1951.